From April 6th. to 15th., 2018, two precious relics of Saint Anthony from the Basilica in Padua will visit the Diocese of Charleston, South Carolina, USA. Fr. Maistrello, a friar from the Basilica of Saint Anthony in Padua, Italy, will be Saint Anthony's companion during this journey. 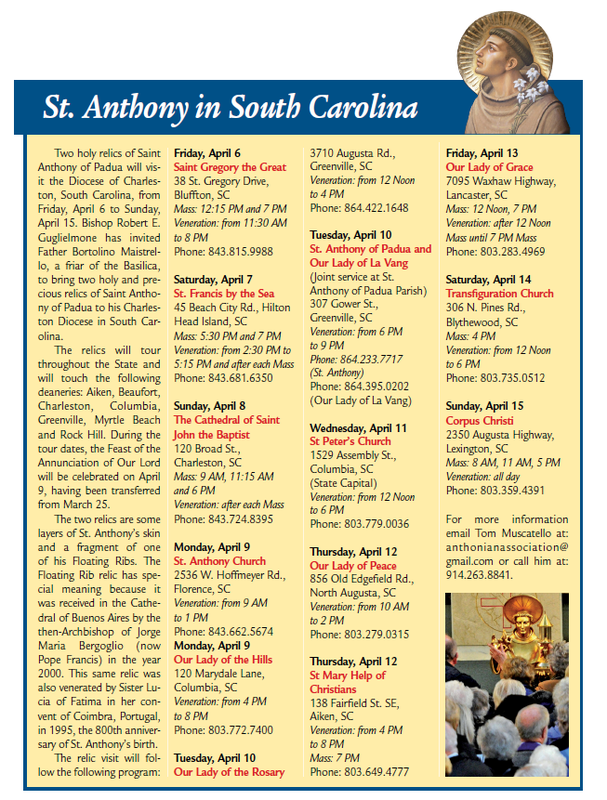 The relics will tour throughout the State and will touch the following deaneries: Aiken, Beaufort, Charleston, Columbia, Greenville, Myrtle Beach and Rock Hill. One of these reliquaries contains the Saint’s floating rib. This is the very same reliquary had been kissed by Sister Lucia of Fatima when it was taken to the nuns at the Monastery of Carmelite sisters in Coimbra, Portugal, in January 1995, during the commemorations for the 800th anniversary of St. Anthony's birth.